Should one consume ghee and coconut oil? Are rice and wheat a strict no as part of a diet plan? Are you lost amidst all the confusing nutrition information present out there and want to know authentic answers to them? Do you have health related queries which need to be answered and reassured by a qualified professional? 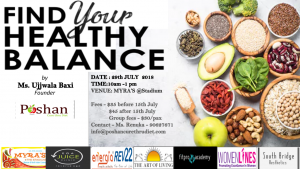 Our upcoming event on Find your Healthy Balance with the right type of foods and lifestyle will help you understand the power of nourishing foods and how you can use them in your daily regime to live a more fuller, happier, healthier and abundant life. At Poshan Cure Thru Diet, we safeguard our clients from following any fad diets and lay the correct foundations of balanced nutrition with a hint of Ayurvedic guidlines. Keep a watchout on our social media posts and know what more you will benefit from at the event. Our esteemed sponsors have some amazing gifts lined up for in goodie bags. To register, kindly contact Mrs. Renuka (contact details on the flyer) and do avail the exciting promotions on tickets by registering together with friends before 15th July. You surely do not want to miss this event!